Last week, after a fifteen-plus year hiatus from the sport, I went running with my daughter. We went up the slight hill and down the other side and she reminded me to “run through the bottom” – to use the hill’s slope to fuel the steps ahead. We moved out of the shade and into the sun and I started to think about walking. Walking, really, had been on my mind since before we began. Would I walk? Would I not? Was I capable of making the whole distance at a slow and steady jog? Sure, I’m running now – in the shade, downhill – but what about the sunny patch along the road? the slow, steady incline near the house? I had been thinking about running for a long time – for a year, really, if not more. But before I could get started, I seemed to need to know how I would end. Was I starting a lifelong habit? Would I lose ten pounds or more? 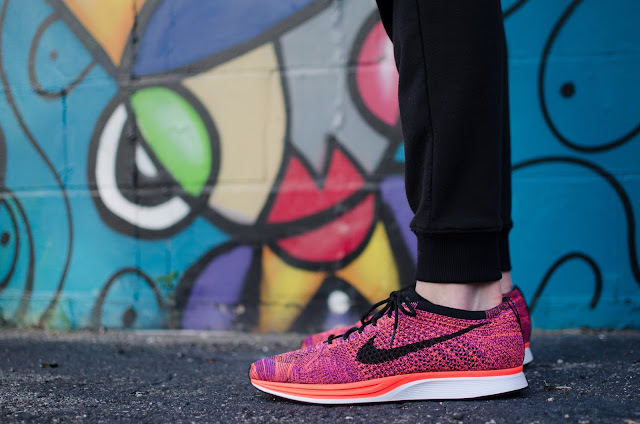 Was I going to be a ‘Runner’? Or was this a one-time deal, a passing fad, maybe yoga or Pilates were more my kind of thing? It seemed I didn’t think the effort was worth it if I couldn’t guarantee some intangible future result. So, I didn’t run. Until last week, when something in me had had enough and I decided to let go of the need to know and take it one step at a time. Trotting along the trail, I recognized my familiar tendency to race ahead, to absent myself from what is – a slow and steady jog – in favor of the fear and fantasy of what might be. So, I started practicing as we ran. Here. Now. This., I thought. Each time I wondered if, when, I would walk, I repeated the phrase. Each time I wondered how far I would get, I returned to where I was. And while this might seem like an inspirational post about exercise and the will to overcome – I assure you, it is not. I don’t really like running at all. I may keep at it, I might not. But what I noticed (and what may be enough, for now, to keep me coming back) is the way even this small thing – twenty minutes on a trail with my daughter – offered an invitation to the spiritual practices of presence and return. On the final stretch of road, my daughter sprinted ahead, leaving me to climb the hill alone. It wasn’t as hard as I thought it might be. My most recent newsletter featured a reflection on the phrase "This. Here. Now." You can read that essay here. Do you ever find yourself plagued by a need to know? What practices do you use to stay in the present and move along one step at a time? I'd love to hear in the comments below. “What’s with the bracelet?” he asked. The cuff in question, made of brightly colored fabric and secured with two snaps, circled my left wrist. Across the top, the word, ‘joy’ was written on a piece of frayed ivory canvas. I was making my rounds at physical therapy - moving from arm bike, to squats and leg lifts – when the young therapist posed his question. “I made it,” I said – an honest answer, but short of the full truth. The conversation moved on and did not circle back around, the moment was lost. I was left mulling my reticent reply and wishing I’d been clearer. Have you ever lost something and, when you found it again, you wanted to do everything you could to keep from losing it again? That's how it is for me and joy. 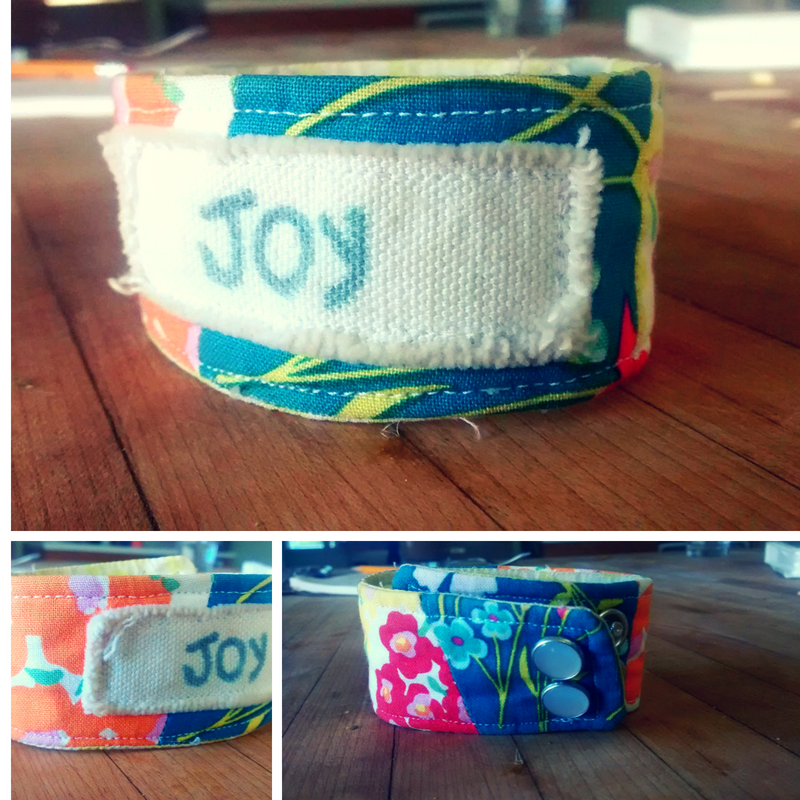 So, I made a bracelet in all the brightest colors, the happy, vibrant ones, and wrote the word “joy” on it. I wear it to remember to hold on to joy. I don’t know what that young man would have said had I unloaded my frightfully serious reasoning on him that day. But, I wish I had, because it was the truth and sharing truth with others often helps solidify it in the deepest parts of ourselves. This summer, as I prepare to transition from working at home to working at a church again, I’ve been looking over these past seven years of life and taking an inventory of sorts. What have I been given in this time that I want to carry with me for the work ahead? One these gifts is joy - the reminder to cultivate and choose it, to recognize it not as an optional add-on to the spiritual life, but as a fruit of the spirit, an essential marker of the presence (or absence) of God in each of our lives. 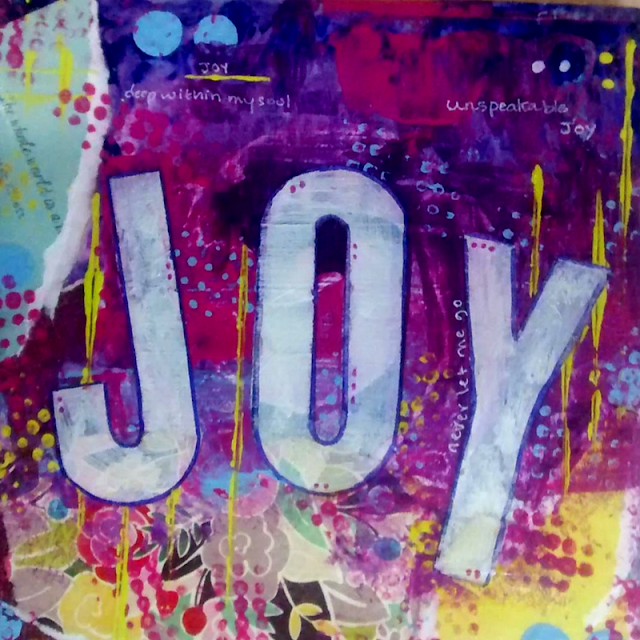 To remind myself of this truth, I made a small painting to hang in my new office, a painting filled with gorgeous colors, patterns and textures and one simple word: joy.